Last week, I was making a batch of those cookies I posted about yesterday and decided to let him help me put all of the ingredients in. 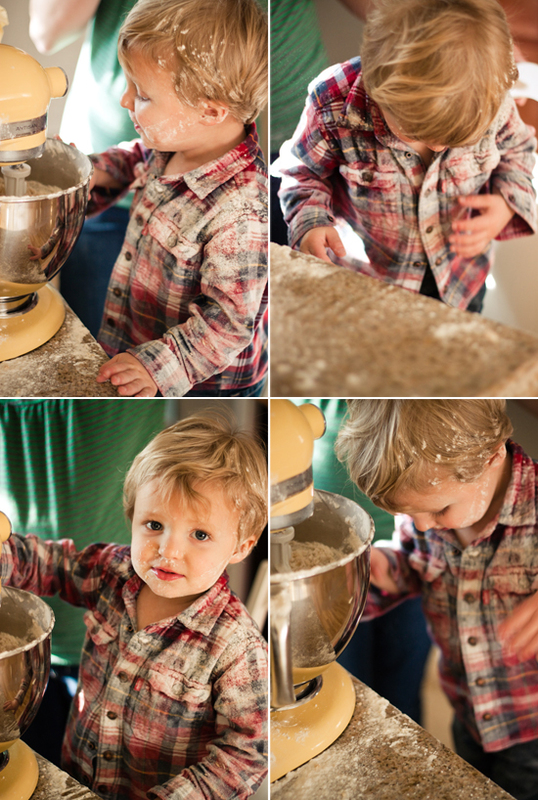 He was doing a great job...until I added the flour. Although the mess wasn't super fun to clean up, he looked too stinkin cute all covered in flour from head to toe. I couldn't help but snap a couple of shots! Hope you have a Happy Friday and a great weekend! I have been using every nap time this week to work on the bedding for my Vintage Bassinet and things are taking a little longer then I had expected. But I'm hoping to finish things up sometime tomorrow! You're such a good mom!! We all need to make sure we include our kids in more messy moments. Haha that just made my morning. How adorable. I think I had my own incident like that once when I first bought my mixer. How precious! What a good mom!